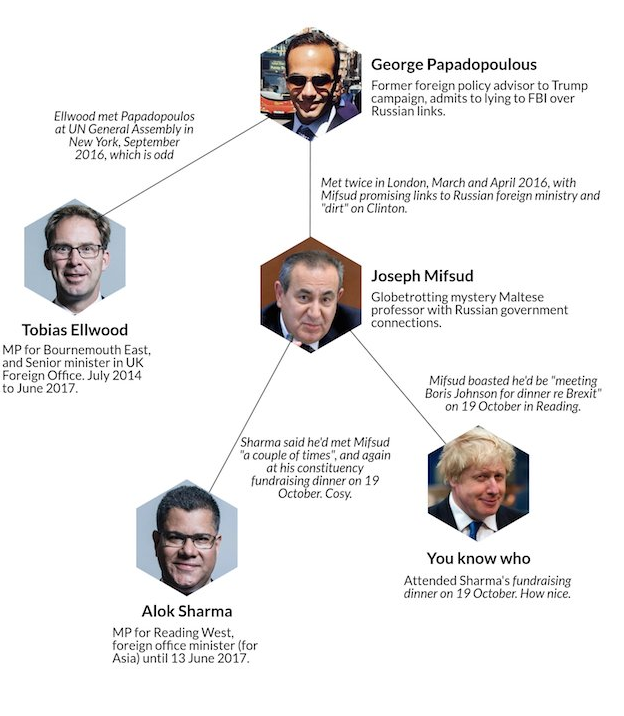 Last Monday, I noted that the building maelstrom around former CIA Director Robert Mueller’s investigations into the Trump-Russia connections had most likely already drawn in the likes of former UKIP Oberscheissenführer Nigel “Thirsty” Farage and several of his pals, and was now getting awfully close to the Tories. There were denials. There was much whataboutery. There was dismissal. And none of it has worked. As I pointed out, the “mystery professor” who then Trump aide George Papadopoulos had met in London, in his search to gain Russian connections and thus obtain “dirt” on Trump’s challenger for the Presidency Hillary Clinton, was Maltese Joseph Mifsud, who has since gone to ground. 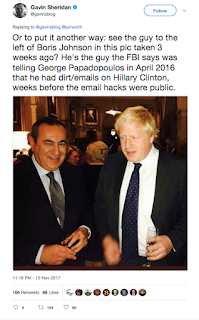 Mifsud had allegedly met with a number of Tory MPs, one of whom was London’s formerly very occasional Mayor Alexander Boris de Pfeffel Johnson. Bozza, though, suffered a significant memory lapse when faced with Mifsud’s claim that he would be “meeting Boris Johnson for dinner Re: Brexit” at a constituency dinner of Reading West MP Alok Sharma. 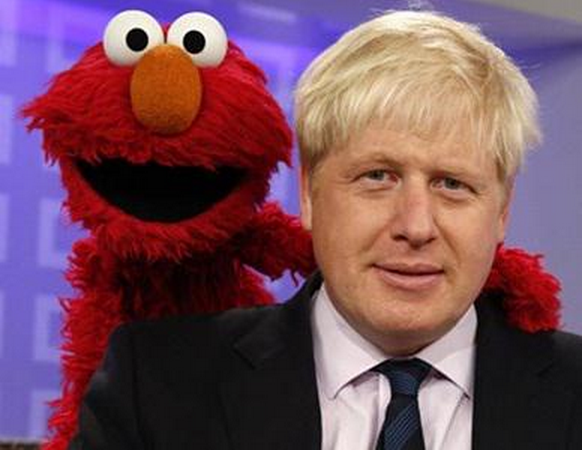 As Carole Cadwalladr and Michael Savage’s Observer piece noted, “A Foreign Office source said: ‘The foreign secretary has not knowingly met this person, planned to meet this person, or indeed ever heard of this person before’”. Bozza says he didn’t meet the Prof, honest. Alok Sharma duly pitched in on his fellow MP’s behalf, telling “I did not introduce him to Boris Johnson and I don’t think anyone else did either”. But that did not mean Bozza did not meet Mifsud at that dinner, or on any other occasion. And this matters right now, as our Foreign Secretary’s job is well and truly on the line following another recent gaffe. By getting his facts wrong about the visit of British-Iranian woman Nazanin Zaghari-Ratcliffe to Iran, and then failing to apologise and withdraw his comments that she had bee in the country teaching journalism rather than taking a holiday, Bozza effectively condemned Ms Zaghari-Ratcliffe to as much as five more years in an Iranian jail. It was the kind of foul-up that even his most diehard supporters found difficult to excuse. Worse, Bozza has now interfered in the affairs of another EU member state by denouncing the partial ban on bullfighting in Spain - where that sport has been in decline for some decades now - and called it “political correctness gone mad”. One Spanish guest at the dinner where Bozza made this gaffe “is reported to have told a British MP: ‘He’s a clown. He’s not fit to represent your country’”. Could it get worse for the accident-prone clown? As if you need to ask. As Gavin Sheridan observed, “see the guy to the left of Boris Johnson in this pic taken 3 weeks ago? He's the guy the FBI says was telling George Papadopoulos in April 2016 that he had dirt/emails on Hillary Clinton, weeks before the email hacks were public”. The bloke enjoying a drink and a chat with Bozza is Joseph Mifsud. Whom Bozza denied meeting. He made that denial less than three weeks ago - which means he’s been caught with his pants on fire again. So if his tenure of the Foreign Office was “on the line” before Sheridan’s latest find, where is it now? Hello Theresa May. No pressure. "Mr Johnson is understood to be considering changing the formal record of his testimony, although it is not known whether he will retract the claim. One ally of his said that Mr Johnson was extremely careful with such cases and, if there had been an error, it was likely to be because of mistakes by one of the officials"
He had to depend on officials? I knew from following the news. Admittedly I don't have his short term memory problems reported in the article. WHAT WAS THE "DIRT" ON CLINTON? (If there was any). It still doesn't change the dynamic that the election was between a mass murdering gobshite, Clinton, and a fruitloop property developer spiv, Trump. All it was and is is a faction fight between far right yahoos. Which is all Yank elections amount to. Meanwhile, tell me again how many Pentagon generals and Texas fascists Trump has employed in "his" administration. Question is - will the end of Boris Badenuff presage the end of the UK's Time of Troubles? "No hard evidence" either way mind.